Healthy Matcha Green Tea Nut Butter — combine earthy matcha with rich and buttery macadamia nuts and cashews, and voilà! You’ve got yourself a deliciously healthy nut butter that’s just begging to be dug into with a spoon! This is super easy to make too. 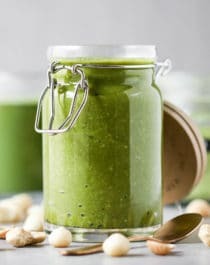 All you need are 5 ingredients and a few minutes to whip up this creamy, 100% addictive Matcha Green Tea Nut Butter recipe. Oh, so you like eating spoonfuls of pure joy? Good, good. Me too. And that’s what this Matcha Green Tea Nut Butter is. In a food processor, add the macadamia nut butter, matcha powder, and vanilla paste. Blend until completely smooth. Add the almond extract and stevia extract and blend one last time. Scoop the mixture into serving jars and refrigerate to store. Spread this heavenly green goodness onto warm toast… or Banana Bread! Use it as a dip for some sliced apples. Or dark chocolate. Spoon it on top of your Matcha Oatmeal. Maybe even pancakes and waffles too.